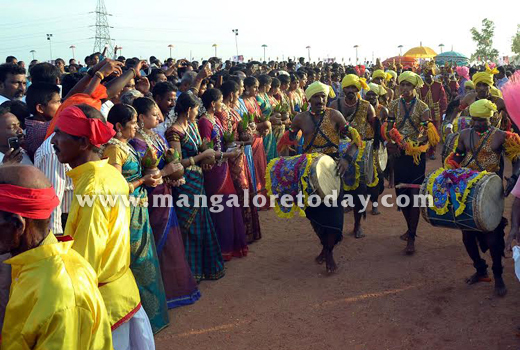 Mangaluru, April 13, 2015: A spectacular civic reception was organised on April 12, by "D Veerendra Heggade Padma Vibhushan Abhinandana Samiti’ to felicitate and laud Sri Dharmasthala Dharmadhikari D Veerendra Heggade who has received the Padma Vibhushan award, at Alva’s Palace Ground in Moodbidri. The honouree along with other dignitaries arrived in a procession at the venue. 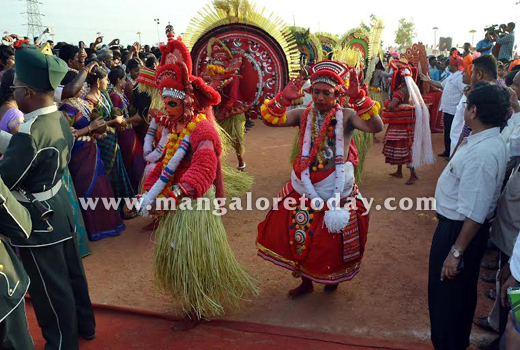 The colourful procession included traditiona giant dancing dolls, Shankha by Srinivas Poonjalkatte, Kombu and Chende from Moodbidri, colourful umbrellas, Aati Kalanja by Karunakar Guthigar Sullia, Koragara Dolu, Pooja Kunitha by Devaraj Mandya, Mysore police band, Theyyam, Chitradurga band set, Nagari by Manju Mandya, colourful Kalladka dolls, Puruliya, Chende from Kerala, Gumte Kunitha, Dollu Kunitha, police band from Mangaluru, Tulunada Vadya by Prasad Mijar, saxophone and Kathakali and such honureable embellishments. 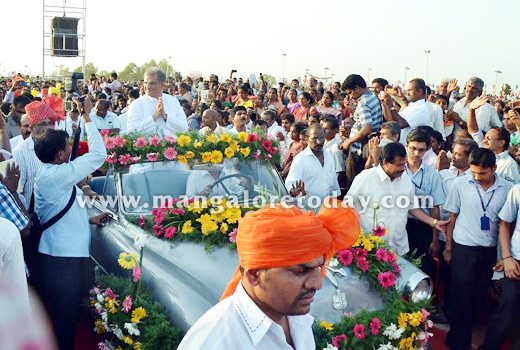 SRI Veerendra Heggade was taken out in a vintage vehicle which was donated to Sri Kshetra Dharmasthala by the Mysore rulers in 1947. 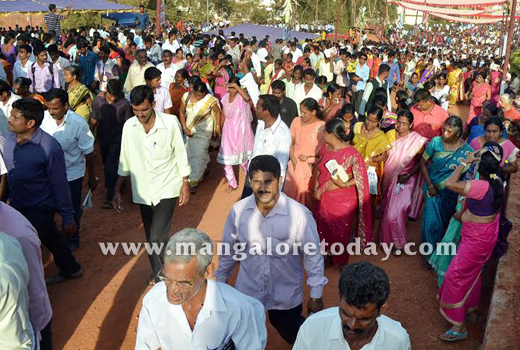 Veerendra Heggade, the Dharmadhikari of Sri Kshetra Dharmasthala, vowed he will not rest and will continue to take up development works that would benefit larger sections of society. Accepting felicitations on being conferred the "Padma Vibhushan" , Sri Heggade said that the works for which the government had conferred the award on him had not been done by him alone. He added “I could see this achieved only because of the power of the seat I am sitting on. The award is for the seat of the presiding deity,” he also said the great national award recognised the works done by his 22 predecessors. 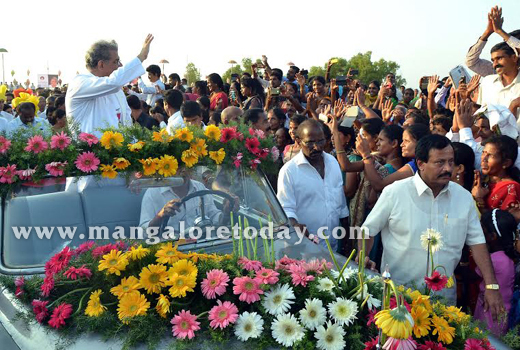 Sri Heggade said that he was being asked to take up works for the welfare of the disabled and senior citizens. “I am happy people want to me to get involved in various works. Whatever I think helps people, I will certainly take it up,” he said. He received award on behalf of hundreds of personnel who worked tirelessly in the rural development programmes, he said. 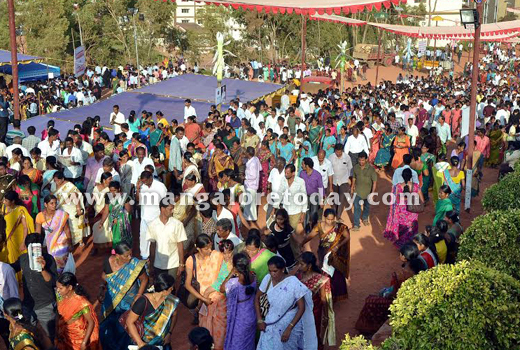 DK District in-charge Minister B. Ramanath Rai said Heggade had made Dharmasthala a seat of solidarity and peace. 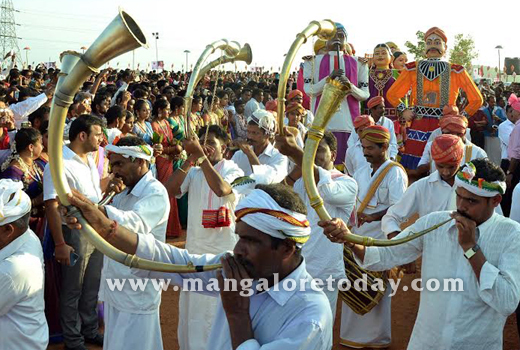 Udupi MP Shobha Karandlaje said Mr. Heggade’s initiatives such as SIRI and RUDSET had empowered a large number of people from rural areas. Pejawar Mutt Seer Vishveshwara Theertha Swami, Charukeerti Bhattaraka Panditacharyavarya Swami from Jain Math, Former Chief Minister and MP Veerappa Moily, Dakshina Kannada MP Nalin Kumar Kateel, Nitte University Chancellor Vinay Hegde, South Canara District Central Cooperative Bank Chairman M.N. Rajendra Kumar also spoke. Speaking on the occasion, former chief minister H D Kumaraswamy appealed to Sri Heggade to draft out a drinking water project, in association with the Government, to aid the lives of all citizens of the State. Through SKDRDP, the pure drinking water project has been initiated in several districts. The Self Help groups initiated by him has helped in empowering women. Former union minister Veerappa Moily said that Veerendra Heggade has concern for society and has carved a niche in all spheres of life through welfare programmes of the SKDRDP. MPs Nalin Kumar Kateel, Shobha Karandlaje, Pejawar seer Vishwesha Theertha Swamiji, Moodbidri Charukeerthi Bhattaraka Swamiji, Alva’s Education Foundation Chairman Dr M Mohan Alva, Nitte University Chancellor N Vinay Hegde, Minister for Youth Empowerment and Sports Abhayachandra Jain, former union minister Janardhan Poojary, Yenepoya University Chancellor Yenepoya Abdulla Kunhi and others were present. Earlier, SCDCC Bank president M N Rajendra Kumar welcomed the gathering. 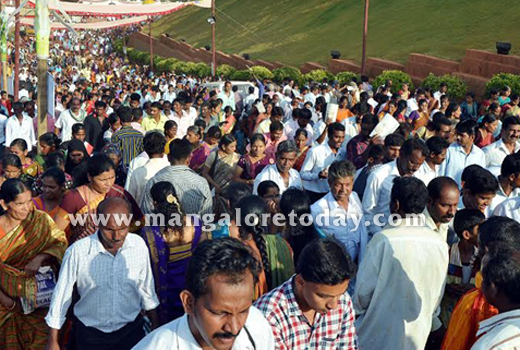 To encourage people from every nook and corner of the district to attend the programme, a pick-up facility was arranged from various parts of Mangaluru taluk. 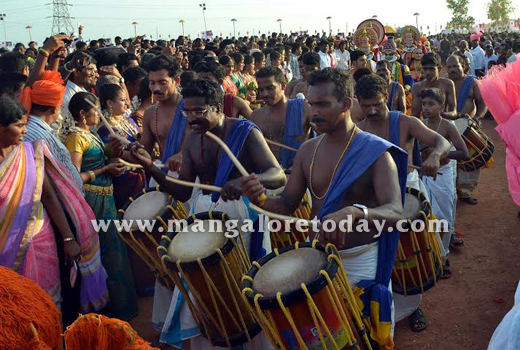 Bus services from Mulki, Kinnigoli, Mukka-Surathkal-Bykampadi, Kavoor-Bajpe, Kaikamba, Vamanjoor- Gurupura, Nirumarga- Padau, Kadri- Urwa, Ullal-Thokkottu- Pandeshwar, Someshwar, Konaje, Uppala, Talapady and nearby areas were arranged and helped the people to visit and witness the grand reception. 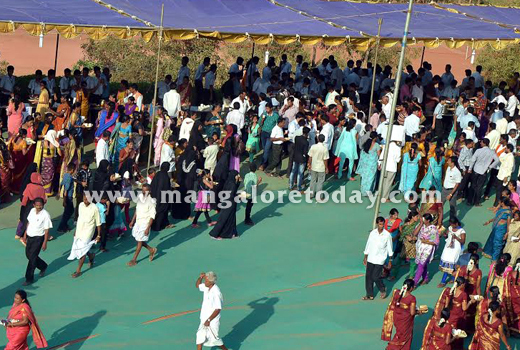 At least 60,000 chairs were placed to accommodate the people at the ground covering 12 acres. The beautifully designed stage was 200-ft long and 36-ft wide. Health Minister U.T. Khader, Urban Development Minister Vinay Kumar Sorake, Minister of State for Youth Services and Sport K. Abhayachandra Jain, Cine Actors Jayamala and Vijay Raghavendra and former Minister Rani Satish, Chairman of Alvas Education Foundation Mohan Alva also participated in the function. There was a mammoth crowd in attendance.